it’s 2 am, and we’re driving my friend back to his hotel in Union Square. we’re stopped at a red light and the guys in the cab next to us motion for josh to roll down his window. josh rolls the window back up immediately, his face turning bright red. earlier this evening, i was heading over to a friend’s house for dinner and Grey’s Anatomy. i opened the driver’s side door of my car and noticed my car kleenex cup in my seat. that’s weird, i thought. how did that get that from the cup holder to the driver’s seat? as i settled into the seat, i noticed that the center console underneath the dashboard looked different… it looked kind of empty… my cds were missing! and some mini-drawer thing on the driver’s left that i never knew existed was pulled out! were they trying to hotwire my car?! though my car didn’t suffer any apparent damage, it was unsettling to think that someone had somehow gotten into my car. i know we don’t live in the best area, but it has seemed relatively safe around here. i can’t even pinpoint when the robbery happened, since i haven’t driven my car in a couple days. luckily, since i don’t keep anything valuable in my car, the most they made off with was a bunch of cds, mostly burned. the few orignal cds in my car included cds from a capella groups [definitely no street value] and a Regina Spektor cd [very limited street value since she’s no mega-star]. i’m sad about losing the Regina Spektor cd since it’s the special edition sold at her concerts but at least i’d already ripped it onto my computer. so if you hear me singing “sexyback” a lot, it’s because it’s the only cd left in my car (it was safe in the cd player). rehearsal dinner, wedding, disneyland, and now a 3 hr flight delay. more later when i’ve recovered. early Friday morning we arrived in sunny sunny SoCal and promptly began removing coats and socks and exchanging shoes for flip flops. we had lunch at West LA fave California Chicken Cafe, or CCC as josh calls it. when we got to the hotel, we plopped into bed for a much needed power nap (i’d only slept 3 hrs Thurs night and josh none) before josh had to meet with a friend to go over the ceremony. did i mention he was officiating? after dinner with the wedding party, we all headed over to the church for the rehearsal. the last wedding rehearsal i’d been to was many years ago and i have vague memories of concentrating on the correct pace down the aisle and the appropriate frequency with which to toss flower petals. watching our friends’ rehearsal was a bit surreal. these were friends we had known for so long and they were finally getting married! seeing them go through the motions and practicing the lines, it felt like an actual wedding in front of a small group of friends and family rather than a rehearsal for the big day. after the rehearsal, josh and i went to see Stranger than Fiction, which i LOVED. i loved the uniqueness of the movie’s premise, the cleverness of the dialogue, and the literary feel of the movie. will ferrell was great and i thought dustin hoffman and emma thompson gave especially good performances in the movie. and of course, being the sap that i am, there was a particular scene that i thought was sooo cute. the next morning, we started out with The Best Belgian Waffle Ever (in my humble and limited opinion) at an unassuming yuppie diner called Russell’s Hamburgers in Old Town Pasadena. then we headed to Westwood for a visit to the UCLA store where i bought a sweater to replace my worn out and faded 7-year-old (has it been that long since i was a freshman?) collegiate sweater. then it was back to the hotel to get ready for the wedding. the ceremony was beautiful, and i nearly cried at several points. josh became quite the mini-celebrity as random guests came up to him through the night congratulating him on his performance as an officiant. the next day was d-day, as in Disneyland. when we first planned this trip, i couldn’t even remember having been to Disneyland with josh (either i’m a horrible gf or we’ve been together way too long), but eventually i recalled taking pictures once with winnie-the-pooh and josh. he still claims that we’ve been there twice, but whatever. i definitely haven’t been to disneyland since moving up to norcal, so that’s at least 2+ years (a long time for a socal native). by the time we drove from pasadena to anaheim, parked, got onto the tram (after missing a tram because i was pushed out of the way by some ‘tween girls), bought tickets ($63! ), and got through the line at the park’s entrance, it was 11 am. luckily, the lines inside the park weren’t too bad, especially for a holiday weekend. highlights of the day included riding the new Space Mountain twice, losing miserably in the Buzz Lightyear game/ride, meeting up with an old whs friend and finally meeting his gf, and catching a few minutes of a Daniel Powter performance being taped for a Disney World tv special. unfortunately we had to leave The Happiest Place on Earth at the early hour of 6:30 pm in order to make it to the car rental place by 7:30 pm in order to make it to LAX by 8 pm to be 1.75 hrs early for our return flight because i’m paranoid like that. along the way, we made a detour to fill up with gas and pick up some guacamole fries (which deserve a post all their own) from Albertaco’s. we were running 10 minutes behind, but i figured we were ok, because i was being generous in allotting 30 minutes for dropping off the car and riding the shuttle to LAX. or so i thought. apparently it can take 30 minutes to drop off a car if you’re totally ignored by the Alamo car check-in people. we watched as rental car after rental car was dropped off and driven away, while we stood on the curb by our car waiting for someone, anyone, to check in our car. we asked one employee who waved us off and told us to wait for our check-in person. after another 10 minutes of this josh talked to another employee who took our key, but did nothing with the car. finally, someone else came by for the check-in and when he finished, asked us where the key was [rolling my eyes]. we got to the airport around 8 pm and discovered that sunday evenings is one of the few times that LAX does not have an insane crowd. we checked in with our e-tickets and were surprised to see the computer warning us that we were late checking in. since when was 1.5 hrs prior to departure considered late? after making our way through security, which included josh being pulled for a bag check because i’d forgotten to throw out my terrorist weapon aka water bottle, we realized that our boarding passes did not indicate the gate for our plane. i checked the tv monitors for our flight info, and didn’t find a gate number, but a departure time of 12:50 am. wtf? that must be a mistake, i thought. i found the nearest Southwest desk and asked the attendant about the incongruity on the monitors, and she confirmed that yes, our 9:45 pm flight had been delayed 3 hrs. nice of the girl checking in our bags to warn us, i remarked. there was another flight to SMF departing in an hr, but half our plane was already on that standby list. so not only were we already exhausted from our non-stop weekend, we both had work/school the next morning and now we wouldn’t be getting home until 2 am, we would have to take a shuttle or taxi home (i couldn’t make my friend pick us up that late), and we had 3 hours to kill at an airport. fabulous. and even worse? this meant we definitely could have stayed at disneyland longer. in the end, the flight delay was more like 3.5-4 hrs and it was 3:30 am by the time we got home, brushed our teeth, and fell into bed. getting up the next morning was sooo painful. Saturday, we went to a Halloween party where there were at least 4 people wearing scrubs, which is 4 too many even though there were 100 other people with pretty nice costumes. i think that having to wear scrubs on a regular basis makes the doctor costume very uncool to me, even though i realize these people have nothing to do with the medical field and are probably just fans of Grey’s Anatomy. still, how much effort did that take? put on some scrubs and now you’re a “doctor”. at the least you could get a cane and call yourself House. we got to SF on time for josh’s meeting with his group members to check out their site for their next project. after walking around the neigborhood for an hour and splitting up the work, we headed back to my car, at which point i realized i didn’t have my car keys and the drama began. of all the things that i forget or lose (i.e. glasses), i’ve never actually lost my keys. i’m also not one to lock my keys in the car, especially since i usually use the clicky thing to lock the doors. we peered into the windows, hoping that i’d left the keys inside rather than dropping it somewhere along the 5 city blocks we had walked. unfortunately my keys were nowhere to be seen. and the spare key was 2 hrs away in Sacramento. and josh didn’t have a functioning car, which was why i had accompanied him for his group project work. and my roommate was working in the hospital that day, so i couldn’t have asked her for the huge favor of rescuing us in SF even if i’d wanted to. and josh was supposed to pick something up in Oakland that afternoon. and he’d made plans for us for that evening as well. so we retraced our steps, heads tilted down, scanning the ground for keys. strangely enough we did find a set of keys (not mine) on one block. we asked the people at Trader Joe’s (the only business i had walked into) if anyone had turned in any keys. they did have a set, but not mine. we borrowed their phone book to look up locksmiths and i left my cell phone number in case anything turned up. we called one locksmith who informed us that cars after 1998 were likely to have transponder chips in the keys, so they referred us to another locksmith that would be able to handle the transponder chips. the second locksmith told us it would cost $650 to create the key for a car with the transponder chip system. i’d been prepared to spend some money for this emergency, but not $650 (!!!). we asked the locksmith if there was a way to know for sure that my car had a transponder, but all he could tell us was that a lot of the new cars did have transponders. we tried calling a Toyota dealership to see if they knew about the transponder, and the guy (salesman?) told us that XLE but not LE models (my car is an LE) had transponders. at this point we were wholly confused about the transponder issue and stressed about the extreme cost. and of course, there’s the fact that we may have simply locked ourselves out which would make the whole replacement key thing a moot point. so we called a third locksmith to try to confirm that my car did or did not have a transponder, and he told us that keys with the big plastic top part were keys with transponder chips. however, he quoted us a much much lower price of $225 (whew). with a plan in motion, we grabbed some lunch as we waited for locksmith #3 to arrive and work his magic. he arrived in a black SUV and wore black sunglasses and skinny jeans. with his Russian accent and fancy gadgets, he reminded more of a spy on Alias than the plumber-type i’d somehow been expecting. he unlocked the car and our suspicions were confirmed – my keys were not inside. as he started working on his laptop and fancy gadgets to make a new key, i sat in the car to escape the cold cold wind and josh headed off to finish some more of his neighborhood assessment for his project. 10 minutes later, my cell phone rang, and i picked it up to hear josh saying “abort! abort!” (i’m not kidding). turns out he had decided to stop by the diner next to Trader Joe’s and inquire if anyone had happened to turn in a set of keys. someone had. and they were mine! meanwhile, mr. spy/locksmith had been working diligently on my new key with his hi-tech equipment. i walked over to his SUV to tell him that the keys had been found, and unfortunately we would not be needing a new key. he told me he’d finish making the door key (without the transponder chip) anyway, since this was his first time using this particular machine and he wanted to check it out. so in the end, i got my keys back (yay! ), we only paid $125, and i had an extra door key which could be used for lock-outs or if necessary to make a transponder key at a discounted cost. of course, the whole car key drama had taken up 3 hours and much energy and we still had lots to do. by now, josh had already confessed what the mysterious item to be picked up in oakland and our surprise plans for the evening were – tickets to the sold out Regina Spektor concert! the concert was awesome, and even josh was pleasantly surprised. i was blown away by her opening song, an a capella jazz/blues number called “ain’t no cover” (which can be found on her Live at Bull Moose album). 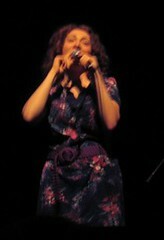 the picture to the left is of her tapping into the microphone as she sings the song a capella (the version on the album doesn’t sound quite as good because the tapping heartbeat sound is very faint). i was also thoroughly impressed by (and jealous of) her piano skillz. she’s quite the storyteller in her songs, and i could see her composing for a musical or a movie, though it would be quite off-the-wall and non-disney. it helps to have a boyfriend who manages to stay calm and comforting and has the random stroke of genius to check a diner that we hadn’t even visited for my lost keys. good music performed live is even better.